One thing that I've read time and time again in countless books about golf course architecture is the importance of finding good, natural greensites for a course. This is the fundation with which we can then build the routing and establish the flow of the holes. Many early architects started to work on a potential course site by exploring every square inch of the land to find the best natural greensites to lay the course on. Then they worked backward finding a fairway, and a teebox...and off they went for the rest of the course. They didn't have bulldozers and other heavy machinery to shape the land like what we have today on modern courses. They mainly relied on the quality, natural features and richness of the land to give life and character to their courses. 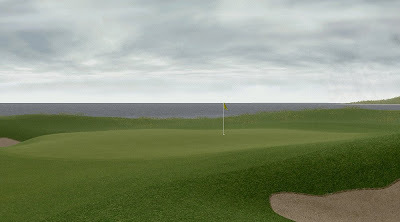 Many famous links courses in the british isles and some more classic tracks around the world have been built that way, and this is in my mind the only way to do it. Nature is of infinite richness, and the architect must work in harmony with it at all times. Like I said in an earlier post, minimum earthmoving have been applied to the landplot I've been given to work with, and this apply particulary to the greensites at Glenmarnock. I took extra care refining and contouring the greensites on the course so they integrate seamlessly in their surroundings and look as natural as the architect program and skills can allow. I found about 14 to 15 natural greensites on the plot that have been used to build the course, with those extra 3-4 requiring a touch more work with the land to get it done. Most of the greens at Glenmarnock golf links are large and undulated with ridges and collection areas that can certainly test the short game. I did choose to be not overly aggressive with the rough around the greens to let the greensites "breathe" more openly with the rest of the course so to speak. Here pictured is the greensite of the 209 yards par3 2nd.